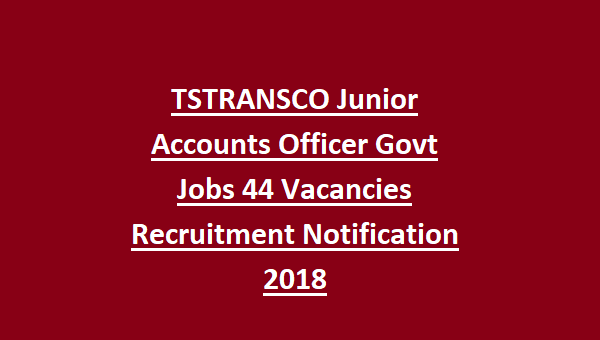 TSTRANSCO Junior Accounts Officer Recruitment 2018: Telangana Power Utilities Department (TSTRANSCO) released a recruitment notification for Junior Account Officer Post on contract basis. A total of 44 vacancies are available in Southern & Northern Zones. Candidates applying to the Junior Accounts Officer post must not exceed the upper age of 44 Years and must not be below 18 years as reckoned on 01-07-2018. The Upper Age-Limit is relaxed up to 5 years for SC/ST candidates and 10 Years for Physically Handicapped Candidates. Candidates interested to join as Junior Account Officer must have secured First Class B.Com/M.Com Degree from a recognized University/Institution. Candidates contending for the post of JAO are liable to pay Initial Processing fee of Rs 100/- payable via online mode. Written Exam will consist of 100 Objective Type Questions divided into 2 sections. Section-I consist of Subject concerned questions for 80 Marks and Section-II covers topics related to General Awareness and Numerical Ability for 20 Marks. Time Allotted for the written Exam is 2 hours. 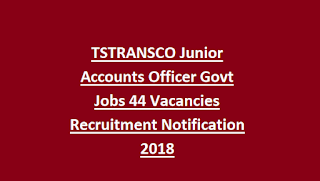 Candidates seeking possession under TSTRANSCO Junior Accounts Officer Jobs Recruitment 2018 can refer the official notification.